On the 18th of August 1916 Mary Gertrude Johnstone was born at Greenbank House, 28 Culver Road, Saltash. Her mother Beatrice Mary, née Limpenny, was a cultured woman who had been a governess in Russia before her marriage, taught piano and cello, and spoke seven languages. Her father was John Johnstone, at that time serving as a captain in the Australian infantry. After the war, Mary's father became an insurance agent and was often absent from home – it was her mother who supported the family (two sons were born after Mary) and who guided Mary's early career. Wanting her daughter to receive the best education, Beatrice, who had already taught Mary to speak French and play the piano, sent her to a convent in Belgium when she was barely seven years old. Although the nuns occasionally chided her for exuberance, they also noticed her talent for music in general and the piano in particular, and arranged for her to have lessons at the Liège Conservatory. After four years abroad, on the advice of an uncle who thought she was becoming more Belgian than English, Mary returned to England, continuing her education at Our Lady of Sion convent school in Kensington, and beginning piano lessons with Ambrose Coviello, a professor at the Royal Academy of Music. At his suggestion, Mary applied for and duly won a scholarship to the Academy. When Mary was twelve years old she saw her first symphony concert, conducted by Basil Cameron. Afterwards she pleaded for the chance to play with an orchestra until her mother wrote to Cameron asking for an audition. At Cameron's instigation Mary adopted her stage name at this time, coupling the Russian diminutive of her given name with an alternative spelling of her mother's Cornish maiden name. Moura Lympany made her concert début with Cameron conducting at Harrogate in 1929, as soloist in Mendelssohn's Piano Concerto №1 in G minor, the only concerto she had memorised up to that point, and for which she retained a lifelong affection. After her triumph in Harrogate, Moura studied for three years at the Royal Academy of Music, continuing her lessons with Coviello. She graduated in 1932, winning both the Challen Gold Medal for piano and the Hine Prize for composition. Moura then travelled to Vienna where she spent nine months studying with Paul Weingarten. Next she won another scholarship to the Royal Academy of Music, resuming lessons with Corviello and, after two terms, taking private lessons with Mathilde Verne, who laid the foundations of Moura's lifelong regimen of practice (two hours in the morning and two in the afternoon). She studied with Verne for a year, during which she made her London début with a recital at Wigmore Hall in May 1935. When Verne died, Moura went to Tobias Matthay, whose maxim "never play faster than you can think", and quiet but firm insistence on relaxation and, above all, naturalness were the foundation of Moura's legendary fluency and musicianship. After two years with him, he suggested she enter the 1938 Ysaÿe Piano Competition in Brussels – the youngest of 79 competitors, no one was more surprised than Moura when she achieved international acclaim by winning second prize. By the Second World War, she was one of the UK's most popular pianists. On the 13th of April 1940 she gave the British première of Khachaturian's Piano Concerto in D-flat (which she had learnt in one month, after Clifford Curzon pleaded he would not be able to learn it in time), one of the pieces ever since most closely associated with her. She played it all over the country and recorded it for Decca, later giving first performances of it in Paris, Milan, Brussels and Australia. She was also the first pianist to record Rachmaninov's complete Preludes. In 1944 she married Colin Defries, an aircraft engineer and amateur pianist thirty-two years her senior, but they divorced in 1950. In 1951 she married Bennet Henry Korn, a 37-year-old American broadcasting executive, and moved to the United States. Moura very much wanted to start a family but she suffered two miscarriages, one of twins, before giving birth to a premature son who died shortly after birth. This marriage also ended in divorce, in 1961. Some years later she became a close friend of Prime Minister Edward Heath, a keen amateur musician, and mutual friends expressed hopes that they might marry, but Moura remained single for the rest of her life. In 1969 Moura was diagnosed with breast cancer and her left breast was removed. Three months after the operation she performed Prokofiev's Piano Concerto №4 for the Left Hand at the Royal Festival Hall, London. Later, at the Wigmore Hall, she regaled her audience with the story of inviting her music-loving surgeon to that Festival Hall performance and receiving in return an anxious letter asking her to confirm which part of her he had removed! She later had a second mastectomy but continued working as before. 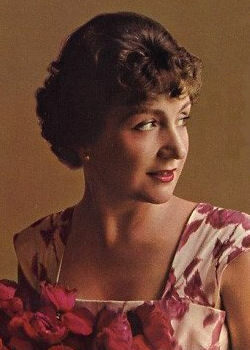 In contrast to her private life, Moura enjoyed triumph after triumph in her post-war musical career. She built up a considerable following not only in Britain but in Europe, the United States, South America, Australia, and New Zealand. For much of her life she was constantly on the move, but nevertheless found time to refine her technique and to expand her repertoire which eventually included at least sixty works for piano and orchestra, with a solo repertoire running from Mozart to Schoenberg. Moura said that she always sang the music in her head, and her warm, graceful, and unpretentious playing sang too. Her recordings were both numerous and popular, the last (the technically demanding Chopin's complete Préludes Opus 28 and a selection of seven of his Études) being made for Erato in 1995, when she was nearly eighty. From her mother Moura inherited a keen sense of adventure and a sharp business acumen. On occasion she could be surprisingly vain – when invited to be a castaway on Desert Island Discs she chose eight of her own recordings! – yet her warmth and sympathy were proverbial and she always showed keen interest in younger generations. She lived in many places, including London and New York. Sent to southern France for reasons of health in 1973, she fell in love with the village of Rasiguères, near Perpignan, and bought a house and vineyard there, but later based herself in Monte Carlo, while still keeping the house in Rasiguères. In the early 1980s she inaugurated Rasiguères Festival of Music and Wine, and in 1986 she started another summer festival, timed to follow Rasiguères, in the village of Guidel on the coast of Brittany. Not forgetting her birthplace, when the Saltash Music, Speech & Drama Festival was founded in 1990 Moura Lympany was its Patron. Having been awarded a CBE in 1979, Moura was made a Dame of the British Empire in 1992. She was also a Commander of the Order of the Crown, Belgium, and a Chevalier, Ordre des Arts et des Lettres, France. On the occasion of her 80th birthday Moura was awarded Portugal's highest honour, the Medal and Cross of Prince Henry the Navigator. It was at this time that she decided to play the piano no longer. Dame Moura Lympany died in Gorbio near Menton, France, on the 28th of March 2005, aged 88. Share this page: . . . . . . . .
'Welcome to Saltash' is a family-friendly, accessible website funded and maintained solely by the webmistress. Unless otherwise specified, the contents of this website are Copyright © 2016 Sylvia Joyce.